In an age of international consolidation, mega-resorts, paid parking, expensive burgers, and an arms race for snow guns and fast lifts, Mont Alta stands apart. Years ago the lifts were plucked from its slopes. Now, what remains is a reborn ski area dedicated to uphill skiing and natural snow conditions. Vail probably isn’t shaking in their Bogner’s yet. Mont Alta caps its season pass sales at 300, each priced at about $50, and you can’t buy a burger anywhere on premises. Not to mention that calling it 600 feet of vertical could be a bit generous. Still, any skier that realizes that fun can’t be measured with stats will feel right at home here. Lots of snow and a hippie-ish vibe in Val David combine in a way that begs me to call it New Paltz North. For better or worse, insurance limits skiing to passholders except on the special days that events are held. 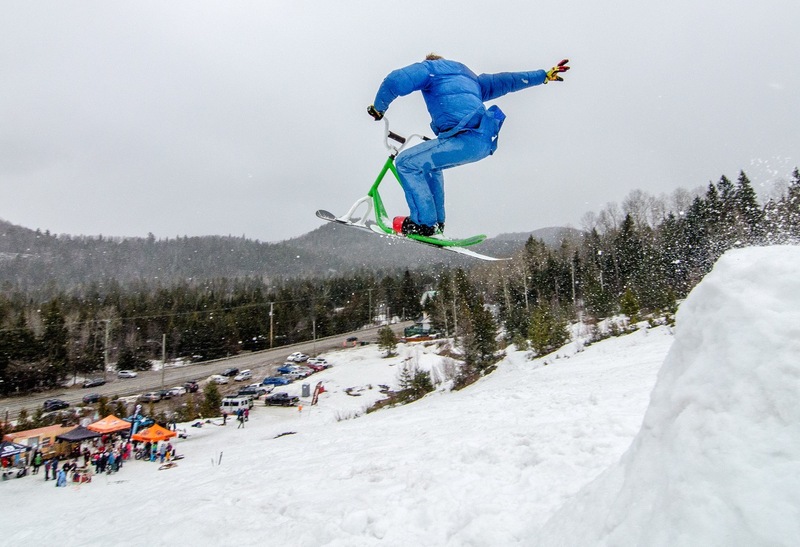 Last year, I was lucky enough to take advantage for Roc & Ride’s La Fievre du Printemps spring skiing party. Despite warm temps and rather ominous skies, accompanied by a buddy visiting from the long baked-out Brooklyn, we made the drive to give it a look. With every kilometer driven, the temperature dropped and the snowbanks grew until we found ourselves at the mountain. We were amazed to see that the base was still more than three feet. 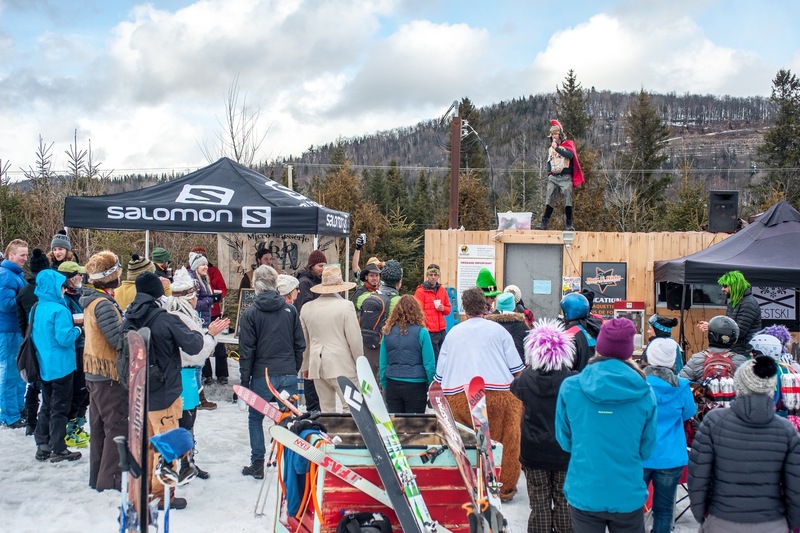 EstSki.ca — a Quebec eastern-skiing collective — was still putting finishing touches on their randonnée course, and we were advised to wait for the other contestants. We attached our skins and talked to the vendors setting up. People were trickling in and it seemed clear that things were going to be big. What we did not know was that the true competition was against the course itself and not our fellow skiers. 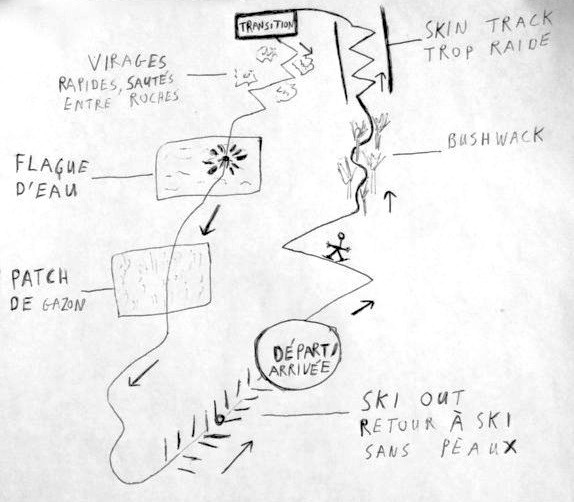 The grueling circuit included a bootpack, innumerable branches to the face, a stream crossing, and huge jumps in front of the crowd at the bottom that resulted in some blood. 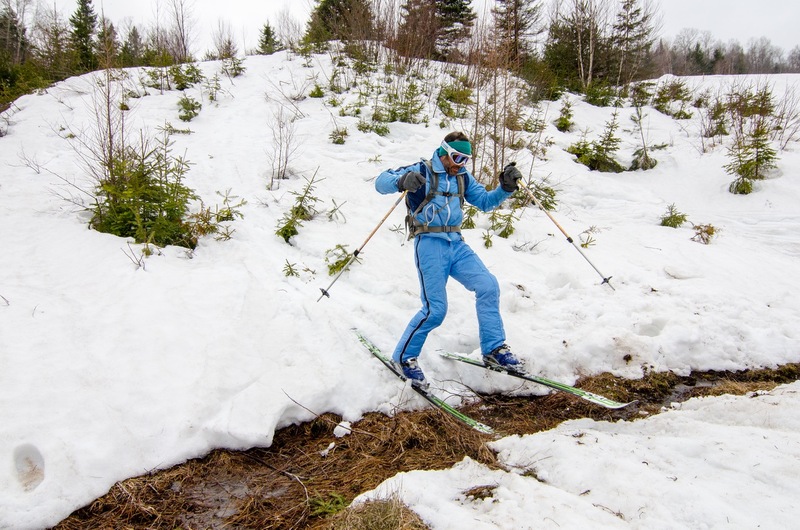 Obviously, these guys knew East Coast backcountry skiing. In any language, there the camaraderie that comes from watching your friends suffer. We exchanged high fives at the bottom and then were each handed stickers and drinks for finishing, my kind of participation trophy. After slogging through the race we were eager to try out some brand new and much lighter gear. We took laps on all of the modern tech tools from the vendors demos — Kingpins, Vipecs, Ions, and new skis from Elan, G3, Fischer, and Xalibu. Bands played for hours, and as the crowd grew, people started doing some even more insane things. One highlight was a race that pitted canoes against homemade sleds fashioned to look like cars. It seemed like everyone was in costume, jumping off something, as the snow continued to fall. The day must have been considered as success by passholders as I just got an email; it’s going down again this year on April 1st, and I don’t plan on missing it. Thanks for all images to Christian Brault. Wow. Not sure I’m quite ready physically for that race but it looks like a great time. I’m impressed that these guys are making a go of it with no lifts at all; could be a model for other communities with closed ski areas. Brownski, I am sure you could get up the course. Pretty much everyone got a couple bruises sliding down the steep section, but it worse for the ego than the body. However, if you want to ski, you gotta walk up something, and easier ways do abound. As far as the business model goes, I am not sure what their goal is. It is a community run fun-club. I think those pass sales pay for a rescue cache or two, maybe someone to go check tickets on weekends, I’m really not sure. It doesn’t have the economic or environmental impact a big resort would have, but as long as it snows they’ll continue getting “100+ day” seasons. 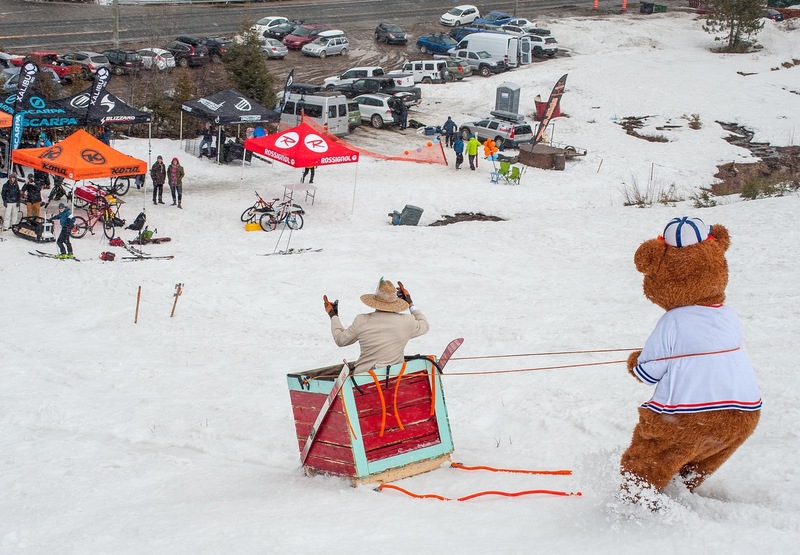 What a rad hill – and a rad event. Nice words. I’ll say. You nailed it big ML ! Way cool. Yeahh ! I would like to go there next year! 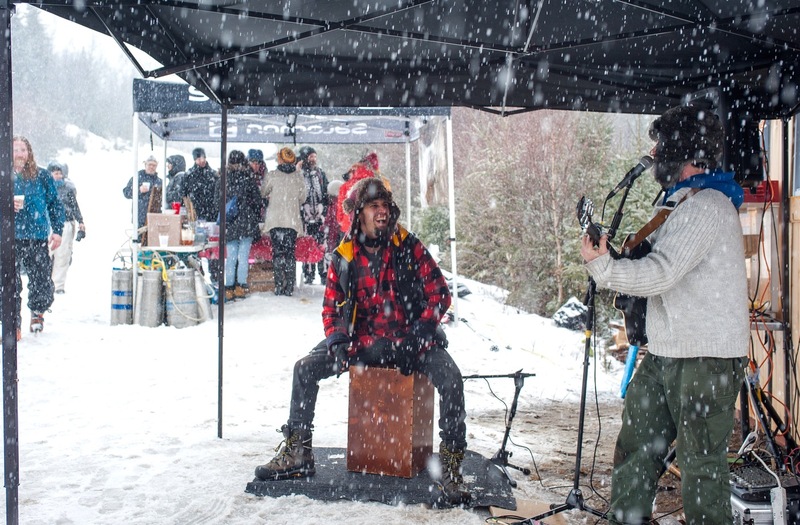 still a top five ski party every year. see you again next spring!